Fast NYSSRA nordic racers! 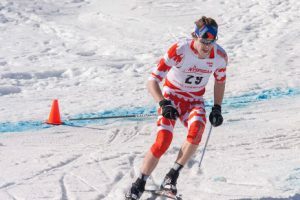 – NYSSRA Nordic Inc.
First of NYSPHSAA championships at GORE: Mattern and Schulz did just as well at the Championships as they have in the NYSSRA series races this year. Jacob Alberga stays in control on the middle downhill turn in spite of some ankle deep churned up snow (their team finished 4th allowing section 7 to bump section 2 from their top spot after Monday’s distance race). In case you Missed it: HURT founder and perennial NYSSRA top tier racer Dave PK beat HURT’s top Biathlete Brian Halligan in this years Saratoga Mini Marathon. -At left The Torniainen’s get ready for 50 Km’s at Winona, no shortage of winter there! The East selected their team for NCAA’s, 2 former NYSSRA all stars: Adam Luban, and Nina Armstrong are headed off to CO for NCAA’s- Good luck from NYSSRA Nordic. This has not been an easy season. Races were cancelled due to lack of snow, then bitter cold and later deep fresh snow followed by ran challenged race organizers. Those who made the most of this season were rewarded with great results and some unique race experiences. Enjoy the snow while it lasts, then get ready for next season.